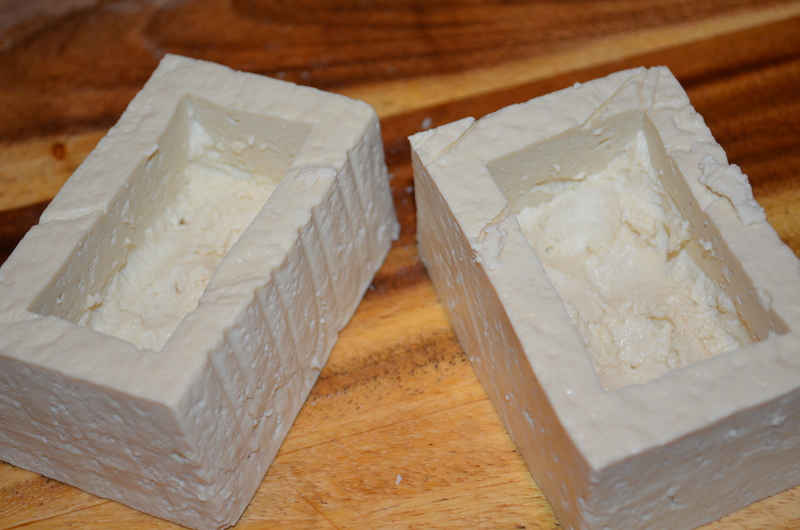 Cut the tofu blocks in half, and use a sharp knife to cut slits 1/2″ in from the sides of each of the four blocks to allow you to scoop out the insides and form the coffins. Leave these to dry in the fridge, upside down, for at least an hour and up to overnight. Blot with kitchen paper, if needed. Mix the pepper, salt, and nutritional yeast together in a small bowl, and use to dust the sides and insides of the tofu coffins. 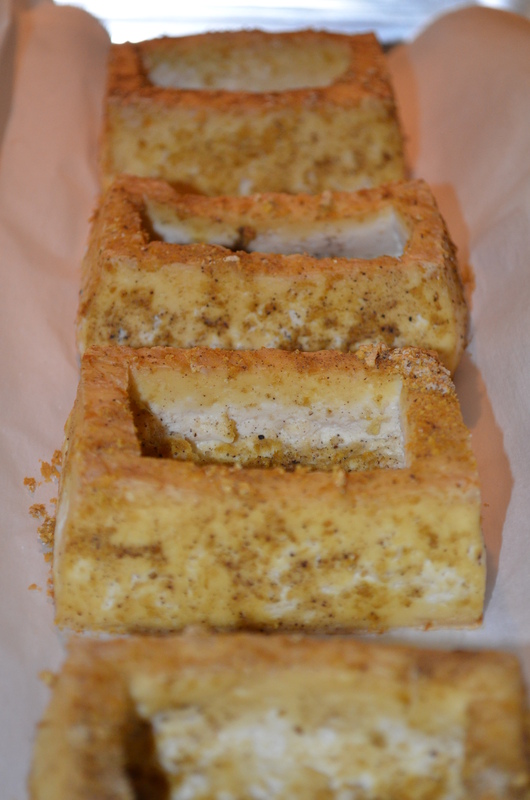 Place the tofu on baking parchment on a baking (cookie) tray, and bake the coffins for 45 minutes at 400F, or until the texture has turned slightly hard at the outer edges. Heat 1/4″ of water in a large frying pan until finger hot, and soften the first of the rice papers in it for about 30 seconds, keeping the edges of the paper down in the water until it stops curling up. 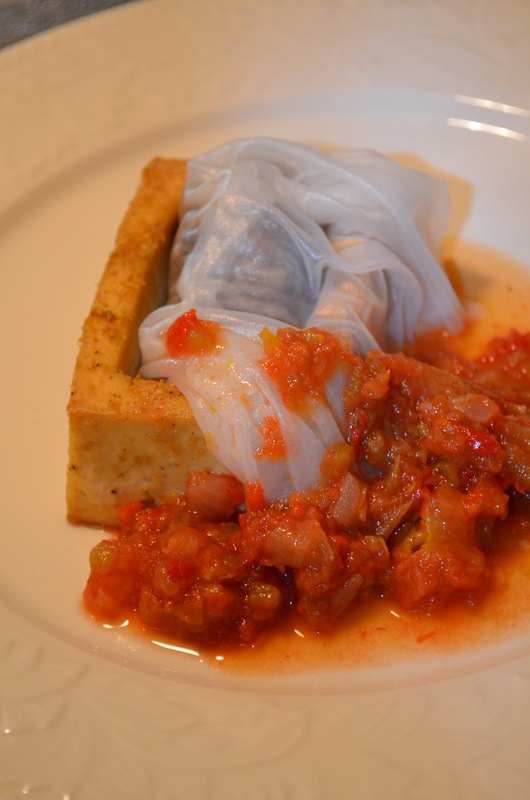 Transfer the paper to a work surface, fashion a 2″ by 1″ sausage out of filling, and drape the rice paper shroud around it before interring it in the coffin. Repeat with the remaining coffins. Serve with tomato ‘blood’; and cooked, white rice ‘maggots’, if desired. My kids love these. They’re a special treat. Galettes are thin, French, savory pancakes (thinner than British pancakes) made partially with buckwheat, and served stuffed with a whole slew of different fillings. The recipes I’ve seen all have wheat make up 1/2 the flour, which doesn’t work for me. I generally don’t like using rice flour as it seems horribly low in nutritional value, but its bland flavor is desirable. However, I recently stumbled upon the idea of using raw cashews to make a rich relatively bland gluten free flour/meal which is less damp than almond flour, but still fairly nutritious, and it really does a fine job in these galettes. The galettes themselves are easy to make, and pretty quick; it’s the fillings that take the time, so I’m more likely to cook them for a special occasion, or if we have fillings left over from a previous cooking session. I stuff ours with ratatouille, or mushroom and black olive sauce, or creamed spinach and sweetcorn, or vegetable chili …… you get the idea. They can even be used to serve up left over take-away/takeout Indian/Thai curries. Those who are happy to eat eggs can also crack one on the freshly flipped galette (see below for details). I know you can buy cashew meal, but it’s a bit expensive, so I grind my own. I know this can be done in a food processor using the pulse option to avoid ending up with cashew butter, and I’ve seen reports of using a Vitamix, though I’ve not yet taken the plunge and bought one of those. Masticating juicers can also be used with great success. I hope you enjoy these as much as we do; even my husband gave them the thumbs up. This recipe makes about 9 galettes: enough for 3 or 4 people depending on how substantial your fillings are. Traditionally folded savory galette (square shape with filling showing in the middle). This one was stuffed with mushroom and black olive sauce, and served with a side of orange tomato sauce. Grind the cashews to a fine flour/meal (see note, above). Stir all the dry ingredients together, along with the egg and enough of the water to make a thick batter, blend, and leave to soak for 1/2 hour. Blend again while and slowly adding the rest of the water. Galette stuffed with spinach and sweet corn, and an egg (par cooked in the microwave). Heat a griddle, or frying pan with low sides (I like cast iron), on medium low with a smear of oil. It should be hot enough such that when you flick water droplets off your fingers onto the oil, it should sizzle. Pour about 1/4 – 1/3 cup (2-3 fl oz) of batter into the center of the pan, and quickly spread it as thinly as possible into a round with the back of a spatula or a traditional French T-shaped spreader. Once the bottom has browned lightly, flip the galette to cook the other side, and place any fillings on the top. Fold two opposite sides over, then the other two, to make a packet. Traditionally, the galette is folded so the filling can still be seen in the middle, but if you want to do an egg, you can fold it over to completely cover the warmed (I zap mine in the microwave oven for 15 seconds), raw egg (with salt and pepper seasoning), and then flip the package again so the top of the egg gets cooked. Remove the galette from the cooking surface, re-grease with a smear of oil, and start again with the next galette. Traditional equipment for galette making. Nice to have, but not essential. I’ve been working on a recipe for American style pancakes this week, and was just trying to put the finishing touches to the recipe a couple of days ago, but something went ‘wrong’ and the mixture came out too thin. I soldiered on and poured the mixture into the pan. Initially I was disappointed because the mixture just spread out too thin (as was to be realistically expected), but then, with the aid of the back of the spatula (the mixture wasn’t THAT thin) and a tweak of the cooking temperature, out popped a British style pancake. Daughter #2 immediately requested the traditional sugar and lemon, as did daughter #1 when she finally got herself down here for breakfast. 6 pancakes later, they were declared a complete success. Suitably mild in flavor, with a texture that was pliant and soft, and very slightly crispy at the edges; they were perfect. British style pancakes filled with apple sauce and (the less British) maple syrup. If you have a high speed blender such as a Vitamix, just put all the ingredients in the blender in the order stated with 1/2 cup of water, and blend for 30 seconds or until smooth. Otherwise: Put the cashews and 1/2 cup (4 fl oz) of water in a blender, and blend until the cashews are smooth. Let sit and soak for 20 minutes. Blend the cashews again to ensure they’re smooth. Add the remaining ingredients and blend again. If you’re making British pancakes, add a further 1/2 cup (4 fl oz) of water. Blend everything again. For American pancakes, a spoonful of the mixture dropped back into the blender/bowl, should take about 10 seconds or so to sink back in. For British pancakes, the mixture should look more like pourable cream. Leave for 10 minutes to allow the flour to soak up the liquid. Turn the temperature down to medium low for British pancakes, or low for American pancakes: you don’t want to use a high heat as this will roast the cashews and give an odd flavor, but you do want them to sizzle slightly. For American pancakes: pour out as many 1/8 – 1/4 cup measures of batter into the pan as will fit without the pancakes touching once they’ve spread out. Cook until the bottoms of the pancakes are brown, and the tops have little holes all over (3-4 minutes), and appear to have dried a little (become less shiny) around the edges. Use a spatula to turn the pancakes over, and cook until the second side is brown (2-3 minutes). Remove the pancakes to a warm, covered plate until ready to serve. Repeat process with the remaining batter. Allow the pancakes to sit for a couple of minutes or so before serving with maple syrup, apple sauce, scrambled tofu, etc. British style pancake ready for flipping. For British pancakes: pour 1/4-1/3 cup mixture into the frying pan, and use the back of a spatula to spread the mixture out as thinly as possible without holes. Cook for a minute or two (until the bottom is brown), then flip with a spatula and cook for another minute. Remove the pancake from the pan and keep warm between two pieces of kitchen towel until ready to serve. Re-grease the pan with a smear of oil, and repeat for the next pancake. Serve with lemon and sugar (traditional), or stuffed with chili, or ratatouille, or mushroom and black olive sauce. British pancake stuffed with vegetable chili. This is a twist on the staple comfort food which is mashed potato. I happily eat this straight out of the pan, but I also use it as an accompaniment to ratatouille, for topping a pie, served with a good gravy, or anywhere you’d use ‘normal’ mashed potato. 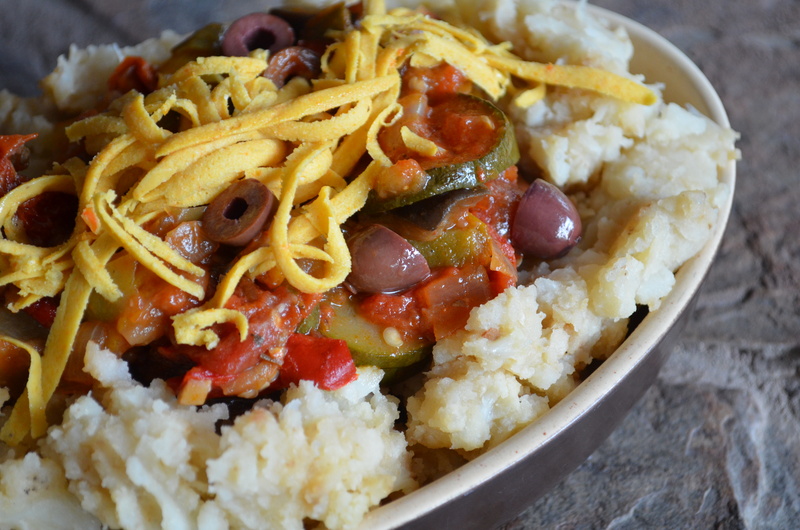 Ratatouille served with mashed garlic cauliflower and potato, and grated faux cheez. Bring a large pot of water to the boil with about 1/2 tsp of salt, and cook the potato until soft but not disintegrating (~10 minutes). In a large frying pan, bring 1/4″ water to the boil with 3/4 tsp salt, the garlic, and the cauliflower florets. Cover, and cook until the cauliflower is almost soft. Remove the lid and allow the water to evaporate, stirring intermittently to prevent sticking. Once the water has evaporated, add the margarine, and allow the cauliflower to brown slightly. Drain the potatoes, and add to the cauliflower (so all the garlic and margarine gets incorporated). Mash all together and add enough non-dairy milk to moisten the potato but not make a paste. Check for salt and pepper, and eat. This is my shortcrust pastry of choice. It makes a tender crust with enough structural integrity to hold itself together, a mild flavor, and a texture that is soft next to the filling, with a crust that will snap off, and a top crust that you can tap. 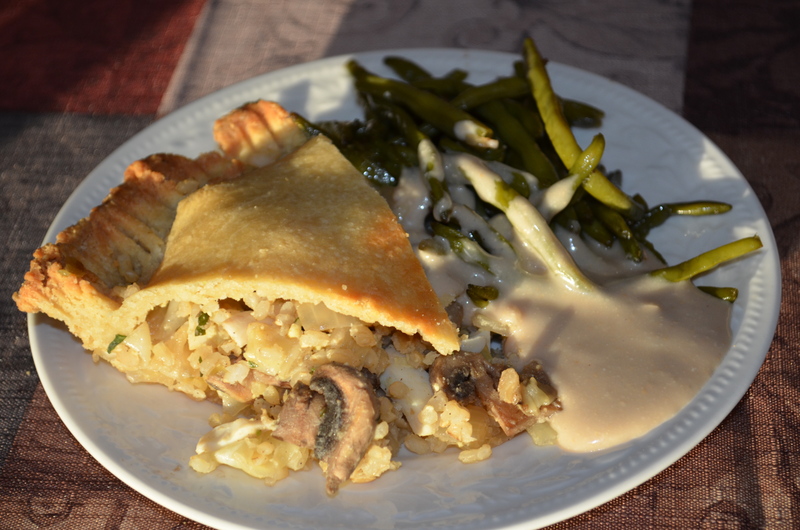 Gluten free pastry on a cabbage pie, served with garlicky green beans and brown cashew gravy. To use, either roll thinly between two sheets of parchment paper (and transfer to the baking dish on the bottom parchment paper, or carefully transfer by hand), or crumble into the greased pie plate and press into place with knuckles. The amount of work done to the dough affects the texture, so make sure to knead the dough before using (~30 seconds in the food processor). Unlike wheat dough, this kneading won’t turn the pastry tough, but it will make it just sturdy enough to handle like wheat pastry. I’ve made this with corn flour (not starch (wrong stuff) or meal (too coarse)) as the second flour, and on a separate occasion I used quinoa. The version with quinoa did have a slight quinoa flavor (which is a little odd, in pastry), though it wasn’t prominent enough to stop my husband from eating the pie! Nutritionally speaking, the quinoa version was better, of course. Note that you can use un-blanched almond flour, if you want to, but the pastry comes out with a less fine texture, and a browner color. Put all dry ingredients in a food processor. Process briefly to mix. Pulse the margarine into the dry ingredients so the mixture looks a bit like breadcrumbs. Add the remaining ingredients, and process for about 30 seconds to develop the xanthan gum. Add sufficient water (~1 tbsp) to make the dough pliant such that it doesn’t crumble too much when you roll it out and try to pick it up, but not so much that it gets sticky. Roll out as discussed, above, and use as required.